Released little over a month ago, the HTC U11 is the latest flagship device by the Taiwanese company and the successor to the HTC 10 and the U Ultra series. Shipping with Android Nougat out of the box, the device comes with all the latest hardware specifications, albeit, without a headphone jack and is now receiving an update with minor performance and camera improvements. With July Security Updates already available for various devices, it must be mentioned that the HTC U11 is still a month behind various other manufacturers in terms of security updates. Moreover, the ‘Squeezable flagship’ still runs Android 7.1.1 Nougat which although is impressive but does not do justice to the high standards set by HTC. Note: The current update is only available for the Taiwanese variant of the device and does not include VoLTE capabilities by default. Users would need to flash radio files separately in order to get VoLTE functionality with this version. Flashing incompatible files may also cause your device to get soft bricked. 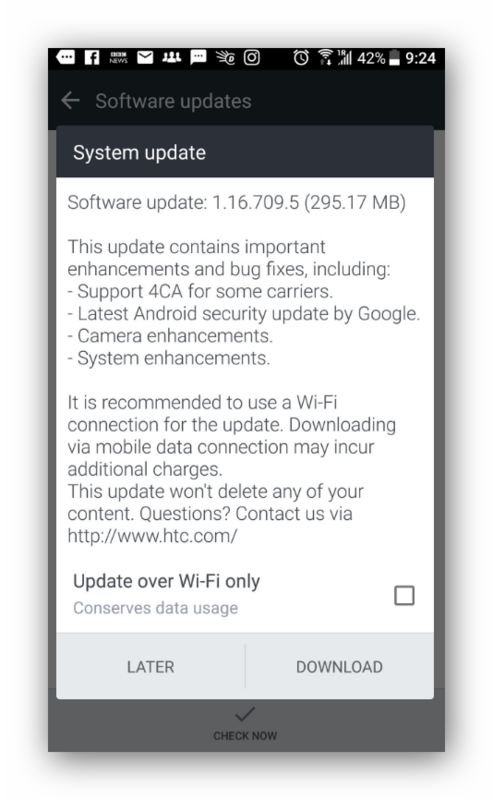 To check update for your device manually, head over to Settings > About Software Updates > Check Now and install the OTA file provided by HTC.